It is a water place situated around 90km from Bangalore. You can reach Sangama by your vehicle where river Arkavati meets with river Kaveri and flows towards mekedaatu. Mekedatu is around 3 kms from sangama. You can walk if you dont have bright sun that day or you have an option of taking bus. 'Meke' means goat and 'datu' means 'to cross'. Here you can find huge holes on the rocks which resembles the shape of goats' hooves. 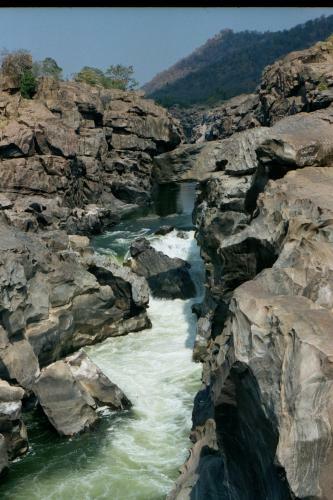 River Kaveri narrows its stream to around 10 metres and flows in high turbulance making the view breathtaking. Dont try to swim in the water since it is highly dangerous. It is advisable to visit this place immediately after the rainy season since there will not be much water in the summer and late winter. It is a beautiful one day trip place to enjoy with friends and family covering the chunchi falls nearby.Food is available at Sangama. members : praveen, subbu, vasudha, prashanth, yashwanth, shruthi, ganapati.